In this tutorial, we will explain how to access a collection of objects stored in Map Collection, using the Spring Expression Language(SpEL) of Spring Framework. Before that we are also going to explain how to configure a collection of objects stored within a Map collection using the <map> tag of Spring Framework within its configuration XML file. We are going to create a java class named Company within the decodejava package and this class contains a String property named name and a Map collection consisting of multiple <key-value> pair of an Integer value(Employee ID) as a Key and its associated Employee object as its value. Besides this, we are also going to define a couple of getter and setter methods within this class to set the Map collection and the String property. Next, we are going to add another Java class named Employee and it is going to contain a String property and a primitive int property. The properties will be assigned a value by the Spring Container, when the Employee bean is created by it using the configuration xml file(to be created in the upcoming section). Eventually, using the bean of Company class, this class calls the method of Employee class methods - getName() and getTelNo() by extracting each Employee bean from Map collection. 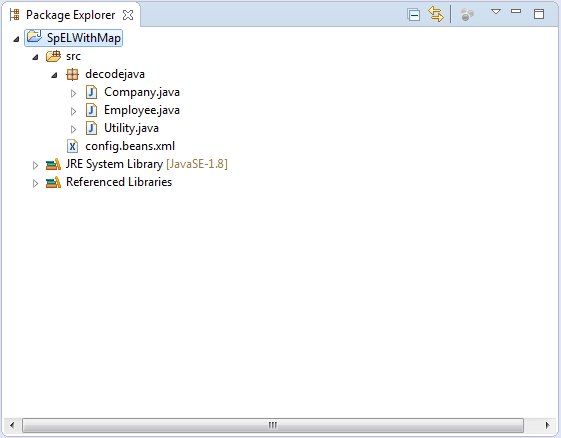 Creates a Map collection of three Employee beans and initiate their values by calling its setter methods i.e. setName() and setTelNo() for each of these Employee beans. This Map collection consisting of multiple <key-value> pair of an Integer and an Employee bean is injected into Company bean. Accesses the Company bean specified in the configuration file by calling the getBean() method of ApplicationContext container. Using the StandardEvaluationContext class to evaluate the object of Company class, which is passed to its constructor. Using the SpelExpressionParse class to parse a String expression, which is passed to its method parseRaw(). This String expression starts with a question mark(? ), followed by a boolean condition within a square bracket. The String expression "employees.? [key == 2]" is parsed and returns a Map object containing the an Employee object with key equals to "2". Eventually, we have used for-each loop to cycle through the Map collection returned by parseRaw() method and have called the methods of Employee class - getName() and getTelNo(). In this file, we have configured a Company bean with a unique id and it contains a collection of Employee beans. The property child element in <bean> tag refers to a property within the Employee class. The name child attribute refers to the name of a property in the Employee class i.e. name or telNo. The value child attribute refers to the value of this property. The <map> child tag element in <property> tag is used to configure a Map collection property containing an Integer and an Employee object in Company class. We are going to add some JARs files to our Java project. These JARs are required in order to successfully execute a Spring project. Project Folder - SpELWithMap is the name of our Project and it is a top-level directory. A POJO class named Company.java. Another POJO class named Employee.java. Finally, after executing Utility class, you will get the following output within the Console window. This output shown below, shows how the Utility class has used the ApplicationContext container of Spring Framework to load the configuration xml file - config.beans.xml, access the beans specified in it, instantiate the Company class and Employee class, by calling their respective setter methods. This class has used StandardEvaluationContext class to evaluate the object of Company class and have used the SpelExpressionParse class to parse a String expression which returns a Map object containing the Employee object with their key value equals to "2" and have finally called the methods getName() and getTelNo() on these objects.